There we go - fresh from the March/April issue of Strategy & Tactics is Berlin '85, a game that focuses on a Soviet invasion of West Berlin in a WW3 conflict set in 1985. It's now I notice that so many people used that particular year for setting a WW3 conflict to happen. 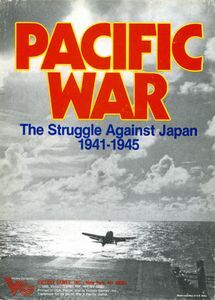 That includes General Sir John Hackett in his novels and Jim Dunnigan in this game. What's especially ironic is that 1985 seems to be the year that the world turned away from the possibility of this conflict as Gorbachev rose to power and started working with Reagan. In any case, Berlin '85 is the brainchild of Jim Dunnigan with bonus star power provided by Redmond A. Simonson for graphics. None other than Nick Karp, future designer of Vietnam 1965 - 1975 is the developmental assistant and he must have been in his early or mid-teens at the time considering that he was in his freshman college year in 1984 when he designed his VG masterpiece. So not even mentioning the other great people who helped develop this thing, there is a whole lot of talent in this one magazine game. 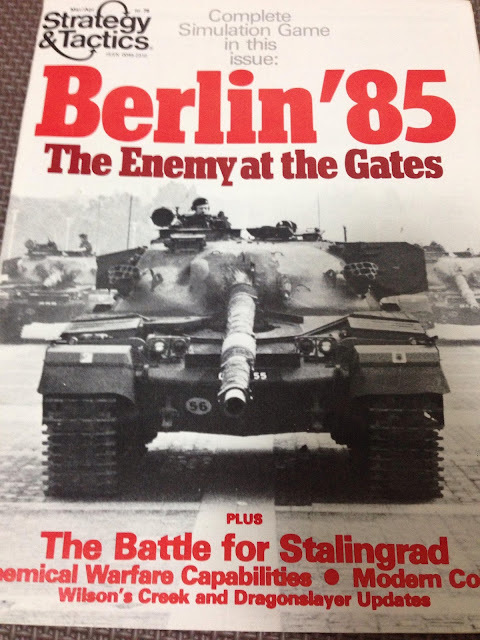 Berlin '85 is a modern day Alamo (I owe that beautiful and concise phrasing to a reader) situation that pits the West Berlin police force, the US, French, and British occupation forces against the might of the 20th Guards Army. There is absolutely no doubt that the NATO player will lose this game. It's simply a matter of how badly they will lose it. I really like games that involve managing loss although I know some gamers prefer more traditional fare where the fate of the conflict is in doubt. The map shows West Berlin and its surrounding environs. We are zoomed out a little bit from a street view but we do get an idea of varying terrain such as urban, industrial, and suburban streets. Parks and canals are represented here. Major rivers such as the Spree are shown winding their way through West Berlin. 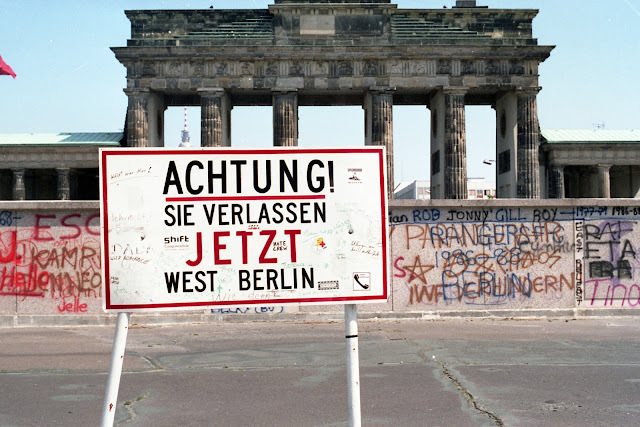 The city's major airports are here too including the Tempelhof, Gatow, and Tegel. 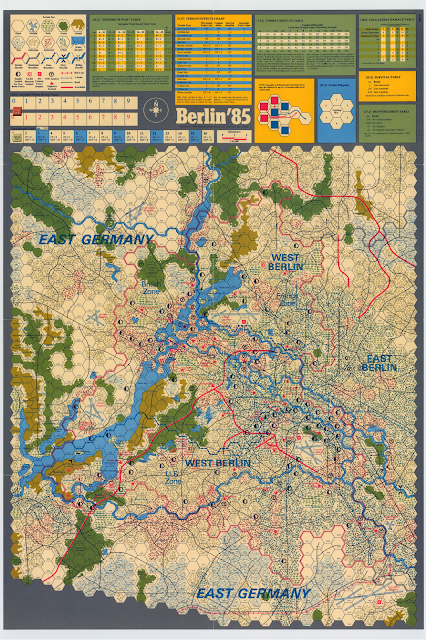 The Warsaw Pact player wins if they take over all the airports in the city as well as all the objective hexes in the city - or in the more likely case, if NATO surrenders before all that happens. But there(s a neat twist here. By destroying units and, in the case of the Warsaw Pact player, capturing objectives, a player gains surrender points. When the Warsaw Pact player has at least 6 more surrender points than NATO, it may offer the "Honors of War" once per turn. A roll on the Honors of War table may result in a NATO surrender, a turn being skipped due to a ceasefire, bonus combat shifts for one side or another, etc. It is a very interesting rule that keeps you guessing as to when the game will end and also spurs the Pact player to take as many objectives as possible without taking too many losses. At the same time, this encourages the NATO player to hit out at as many Warsaw Pact forces as possible. Some other interesting rules reflect the possibility and consequences of severe damage to the city. When the total firepower of artillery into one particular hex is added up, the player rolls a die and the result may be a rubbled hex, which increases the defensive terrain modifier, changes movement point costs, etc. What's really interesting is that if the artillery lands or scatters into a hex with POL storage units, a firestorm can result that eliminates any unit within the hex. The firestorm may also spread to other nearby hexes. More interesting stuff comes in the form of untried units. Since most of the units on the board are well trained but totally inexperienced in combat (this is the opening day or two of WW3 here), their effectiveness in combat is unknown. For that reason, each unit has a face-up combat strength shown as "U". This combat strength is only discovered by flipping over the marker when the unit enters combat. The U-Bahn is another neat little feature of this game and lets the player move units around by subway. This can be used to get around enemy ZOCs and also zips your units around a faster rate. As might be imagined, its a great tactic to use in order to pop up behind your enemy and surprise them or a nice way to get into the enemy's rear and hit their supply lines. Airpower is handled nicely by the use of Ground Support Points. The Warsaw Pact has air superiority for most of the game but there are some turns where NATO has air superiority. It may also gain air superiority by rolling an 11 or 12 when checking for NATO reinforcements during a turn. Ground Support Points can be used much like artillery (it adds to either the barrage strength when attacking or friendly firepower when defending). There are also Warsaw Pact paratroops in the game, which can be used to drop on to hexes in West Berlin. These can also be flown onto a controlled airfield and brought directly into the fight. The Warsaw Pact player gets to choose how and when to bring these reinforcements into the game. The NATO player is never sure if they will get reinforced (they must roll on a reinforcement table to check each turn) and they must be airlanded. 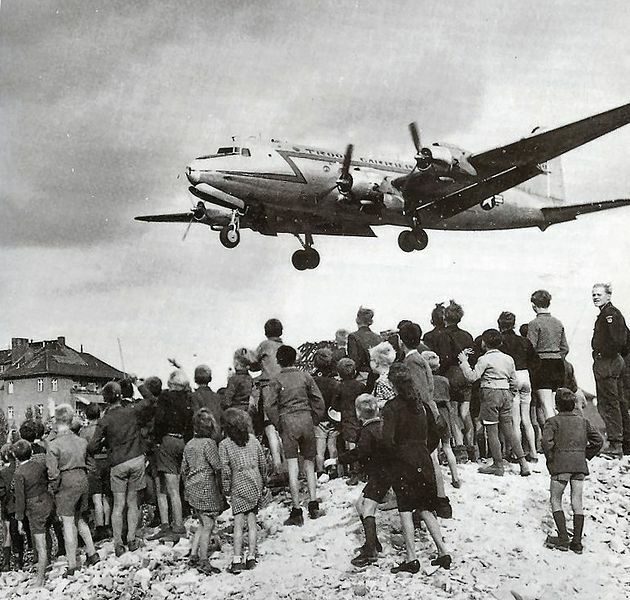 C-54 attempts landing at Tempelhof during the Berlin Blockade. If all NATO airfields have been seized then no NATO reinforcements enter the game. And since the Warsaw Pact will absolutely gain control of those airfields at some point in the game, NATO is well and truly screwed from the start. Some people might not like this but I love fighting losing battles - just ask my wife. If you're still not crazy about this game, there are three scenarios here - which is incredible for a magazine game. The first scenario is Operation Unity, which is a straight-up brawl between the 20th Guards Army and the hapless defenders of Berlin. No spice is added here - you just set it up and let both sides go at it for however long you need. NATO is going to lose and lose badly here. The second scenario, Operation Werewolf, hands the NATO player a little bit of help with a free setup for West Berlin police units (that also get a column shift during combat) and the 10th Jagerbrigade, a kind of special forces West German brigade that gets men set up inside the city just ahead of (and possibly during) the battle. NATO will still lose but it will probably take out a fair few Warsaw Pact units along the way down. Operation Medicine Wheel is the craziest scenario here and looks like great fun. In this scenario, the NATO garrison decides to make a pre-emptive strike into East Berlin before the Soviets can muster an attack. 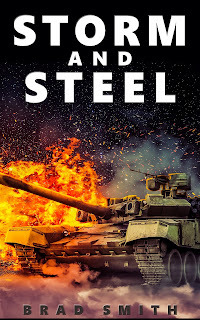 They also decide to try and get as many units as possible into the East German countryside to conduct guerrilla warfare and play hell with the rail network feeding men and tanks to the front. Everything is helter skelter with random Ground Support Units, no reinforcements for either side, NATO surrender off the table, and the WP player starts with his forces unprepared and out of supply until he can make a successful Supply Priority roll starting with Game Turn 8. Wow! I'll be running through the first turn of a game to show how it works in my next upcoming post. Stay tuned for more Berlin '85 fun. Awesome stuff, Brad. Looking forward to this! Thanks Aaron! Good to hear from you. What good timing on this post. 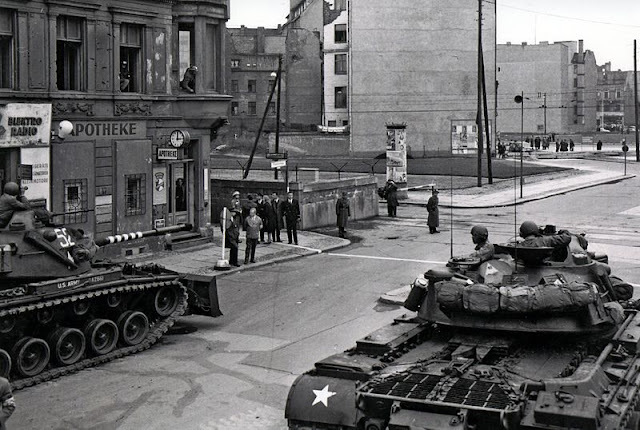 I've been spending some time pondering how to resolve the Berlin situation in my blog regarding a hypothetical NATO-WP war in Europe in 1987. I have to unpack this game to work it through a bit. Maybe get some inspiration. Thanks Mike! Let me know how your game goes by posting about it here in the comments. I do love that game, It's got a lot of that "doomed garrison" thing going. So much so, I am writing a miniatures supplement for it. Great to hear, Jason! Please let me know when you finish your supplement. Sounds very interesting. I love SPI games of this vintage, they weren't always perfect plays but they sure were a joy to look at.